Colette’s The Vagabond tells a story of backstage life in the music halls of turn of the century Paris. The narrator/heroine has left a failed marriage and career as a novelist to earn a living performing two shows a night as an actress in French pantomime. The Vagabond works as a backstage novel and as a source of insight into the its author, Colette. Because the narrator’s biography shares so much with Colette’s, it’s nearly impossible not to succumb to the temptation of committing the biographical fallacy. Since their back stories match, it’s easy to conclude that the novel must be the story of Colette. Love, if you can; no doubt this will be granted you, so that at the summit of your poor happiness you may again remember that nothing counts, in love, except the first love, and endure at every moment the punishment of remembering, and the horror of comparing. While I had more problems with The Vagabond than the one outlined here, there is enough that’s good in the novel to make it a worthwhile read. The peek at theatrical life, Colette’s beautiful writing, the hints at autobiography all succeed in entertaining the reader. 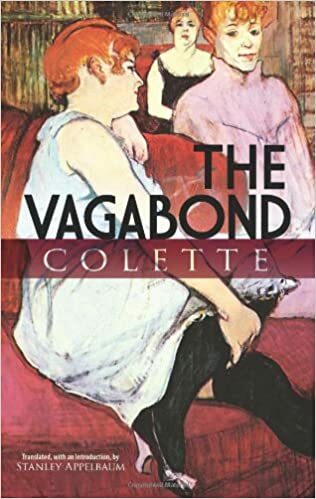 Those lucky enough to read it while in the throes of first love or in recovery from it will find a kindred spirit in Colette’s The Vagabond. I feel like I just read this book, but this is a review from 2011 first published on my old blog Ready When You Are, C.B. I guess it says sometime positive about Colette that I feel like I just read her book a few months ago. If you’ve never read her, this is as good a place as any to start. I think she’s terrific.